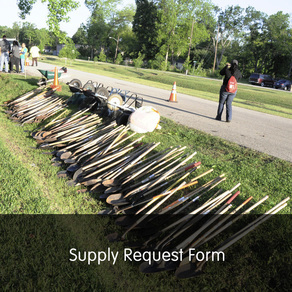 Keep Houston Beautiful (KHB) maintains a warehouse filled with the necessary items to assist community groups with their landscaping/beautification plantings and community/neighborhood cleanup projects. These supplies are available on a first requested first served basis. Tools and supplies must be requested at least two weeks in advance. ALL tool and supply pick-ups and drop offs will be by appointment only. Supplies are loaned only to groups, not individuals, for the purpose of a community-driven cleanup or beautification projects. All tools and supplies are to be stored in a secure location during the loan period. The borrower is responsible for any missing or damaged tools (other than normal wear and tear). Supplies are picked up and returned to the KHB Tool Warehouse located at 5614 Neches, 77026 (inside the City of Houston Solid Waste Management Department's Environmental Service Center). All tools and supplies are to be returned to the KHB Tool Warehouse by their scheduled return appointment or will be charged for all tools and supplies not returned. All hand tools and equipment are to be properly cleaned before being returned to the KHB Tool Warehouse. A service fee of $25 will be charged for excessively dirty tools, coolers, and supplies returned. and help us keep Houston beautiful! *REMINDER: It is MANDATORY that the Cleanup/Beautification Request Form be submitted with every Roll-off Trash Container request. PLEASE NOTE: Tool and Supply distribution is by appointment only. We no longer have staff working on site. Tools and Supplies will not be available for community program check-out beginning February 18th until April 11th. Are you interested in coordinating a corporate day for your employees or coworkers? We'd be thrilled to partner with you! We are always looking to partner with local scouts, youth groups, and civic organizations on a variety of new and ongoing projects. Continue on feeder road to the light at Kelley Street. Proceed through the light going straight. We are in the blue Environmental Services Center Building, last building on the left. Travel north on Hwy 59, exit Crosstimbers and make a U-turn under the freeway. Proceed south on the feeder until you get to the light at Kelley Street. Continue on the feeder and do not turn left or right. Feeder road becomes Kelley Street. Continue on Kelley Street past Jensen. The first light past Jensen is Neches. Continue on Lockwood until you get to the light at Kelley Street. Turn left onto Kelley Street. Continue on Kelley Street past Hirsch and go over Hwy 59. At the first light past Hwy 59, turn left onto Neches. Our partners in this program include The Department of Neighborhoods Inspections & Public Service, District Council Members, Houston Parks and Recreation Department, Houston Police Department, Mayor's Citizens Assistance Office, Public Works and Engineering, Harris County, Solid Waste Management, and the Planning and Development Department.